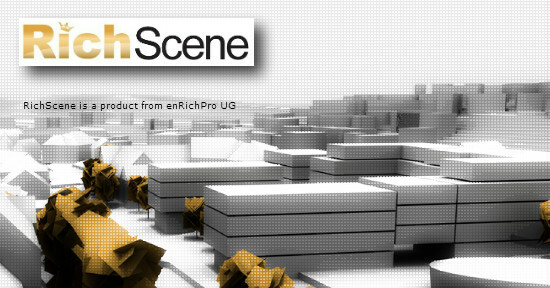 RichScene has a golden top, and a gray bottom in the material editor. Open the 'Add to model' rollup. Render an image - dirt is everywhere. Press 'Add/Update to Diffuse' again. Note: you need real materials on your objects. What would be ´unreal´ materials ? When you create a box, cube, etc 3dsMax assigns a default (wireframe) material. These materials do not allow to attach dirt. mental images and mental ray, are registered trademarks, and are trademarks of NVIDIA, in the U.S.A. and/or other countries. V-Ray and the V-Ray logo are registered trademarks of Chaos Software Ltd. in Bulgaria and/or other countries. Autodesk and 3ds Max are registered trademarks or trademarks of Autodesk, Inc., and/or its subsidiaries and/or affiliates in the USA and/or other countries. All other brand names, product names, or trademarks belong to their respective holders.